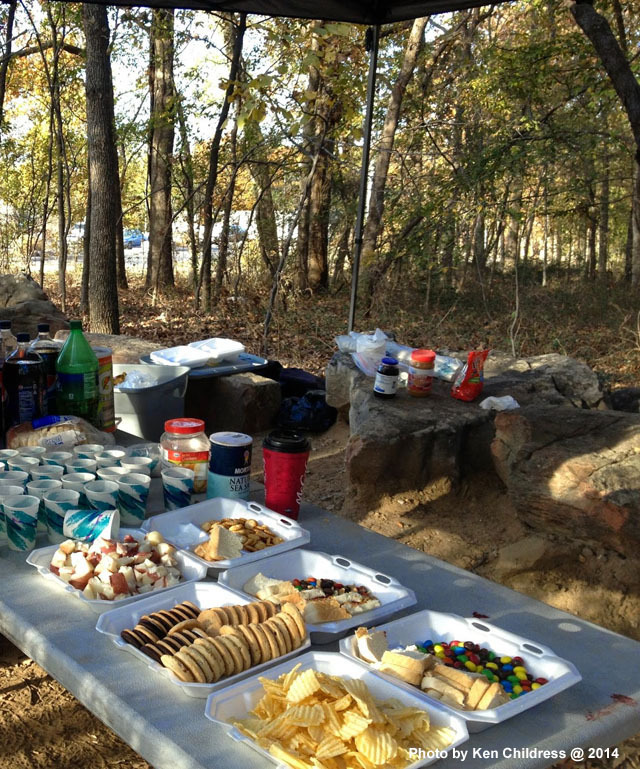 JOIN US FOR TULSA'S PREMIER TRAIL ULTRA! There is a distance to accommodate all levels of runners at the Turkey & TATURS 50K, 25K, 10K trail running event. RunnersWorld and TATUR pride themselves on putting on events with the runners in mind. With well marked courses and amazing aid stations and support we aim to give you the best trail running experience possible. 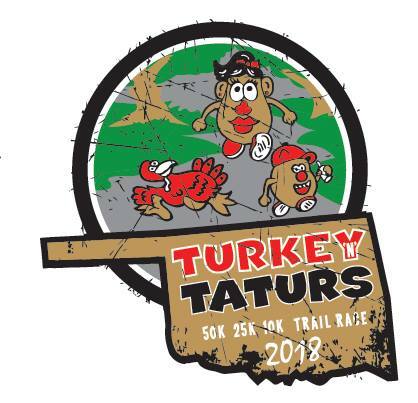 Whether you’re a seasoned trail runner looking for a new challenge, or a road runner searching for a change of pace and scenery, Turkey N Taturs will take you there. Finisher medal to celebrate your victory! You may sign up on paper at RunnersWorld Tulsa any time until saturday, 5:30pm. Registration is also available on race day starting at 5:30am at the start/finish area. Pre-registered packet pick up will be at Runnersworld Tulsa, 3920 S. Peoria, Tulsa on Friday and Saturday, November 2nd & 3rd from 10am to 6pm. Packets may also be picked up on race day. Turkey Mountain is an "Urban Wilderness Area". You will find beautiful lush surroundings that run alongside the Arkansas River. As you approach from the north, you will be able to see it's peak that juts 300 feet above the Arkansas River. Elevation is between 600-900 ft. above sea level. 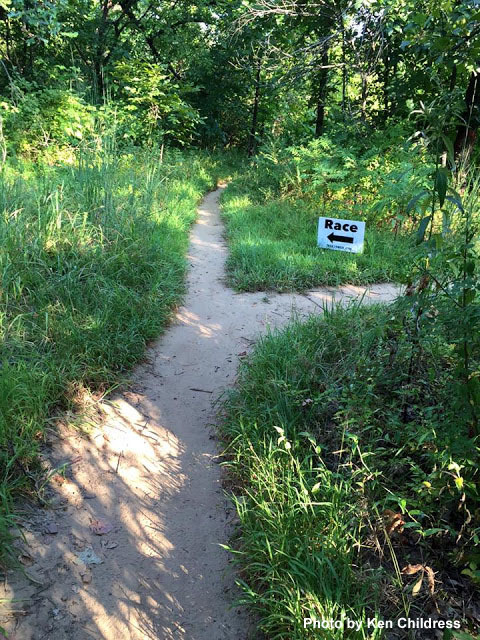 Ninety percent of the course is on narrow single-track trails. Most of the trails are under a a canopy of deciduous tress and amidst a thick layer of vegetation The trails have the sand /gravel /rock surface common to this area and can easily be run on after hard rains. The course has varying degrees of difficulty. There are easy-going non-technical areas, mostly flat and thoroughly negotiable, and there are intense, highly difficult technical areas with short, hard and very rocky climbs. Turkey Mountain is not only a trail runners paradise but it also is a mountain biker's dream. This is all public land and you will encounter many mountain bikers, hikers, and maybe even a few horses. Please give all of them the right of way. It is much easier and for a runner to step off to the side of the trail than it is for a biker or horseback rider. There will be sections of the course that will be very rocky and/or steep. It is highly recommended to walk these areas. The seconds that you may lose is certainly less than the time it takes to wrap a twisted ankle. The races start and finish at theWestside YMCA located at 5400 S. Olympia Ave. The 50K will be an out and back two loop course. The 25K is one loop of the 50K course and the 10K will be a shortened version of the first 50K loop. There is a ten hour time limit for the 50K. All courses will be marked with pink ribbons and signs. Click on the image for full page image with elevation chart. Thanks to fellow runner and geologist Ron Haveman of Sandy Tracks Mapping we have an interactive version of the Turkey N Taturs course map. With this map and the application you can easily track your current location on the course using your mobile phone. 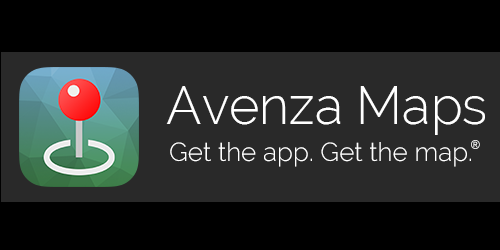 If you don’t already have the Avenza® Maps application you can download it on your phone from the Avenza web site by clicking their logo. Click "Get a map from the store"
Click on the map and then "Install"
You now have an interactive map for the race course that shows your current location. Our aid stations are manned by the best volunteers in the area. Most are trail and ultra runners themselves and anticipate your every need - even before you know you need it. Turkey 'N' Taturs wouldn't be possible without the help of great volunteers. Sign up for a shift at our VolunteerSignup website. Don't worry if you are new to the volunteer scene. You'll be working alongside and learning from the best of the best. We have shifts available Saturday (course marking) and all day Sunday. We have shifts that are good for families. We have shifts that are good for sitting in the woods alone to ponder the meaning of life. To show our appreciation each volunteer will receive a 30% discount coupon from RunnersWorld Tulsa in addition to the hours of unmatched fun in the woods. Without rules there would be nothing but chaos, well maybe mayhem. Turkey 'N" Taturs has just a few rules but plenty of helpful tips and advice to make this a great race. Rule #1 - Leave No Trash On The Course. If you bring it in, you must take it out. There are trash cans at every aid station. Anyone caught littering will be disqualified. Anyone. Rule #2 - Appreciate the volunteers. Many volunteers were up before you preparing for the day. Many will stay out longer cleaning up. Most will do both. Rude or disrespectful behavior towards a volunteer will get you disqualified. Rule #3 – No short-cuts. If you find yourself off course return to the last location you know you were on the course and continue on. Rule #4 - Have fun. That's it, so it should be easy. The rest is up to you. The course is heavily marked with pink ribbon and caution tape. Follow the pink ribbon. Don't cross the yellow caution tape. We recommend you don't blindly follow the person in front of you - they may take off course. Keep your eye on the pink ribbon. While the course never crosses itself there are many locations where runners are on another trail a few feet away – probably running a different direction. Don’t skip over and follow them (especially since they could really be behind you). Use your best efforts to stay on course. If you are knocking down spider webs you are either in the lead or off course. There will be four manned and fully stocked aid stations on the 50K/25K course with sweet & salty foods, soda, water and Gatorade. One on the 10K course. There will be two unmanned water & Gatorade stops on the 50K/25K course. Aid stations will be 3 to 4.5 miles apart. You should bring a water bottle/hydration pack while running Turkey "N" Taturs. Bathrooms or porta-potties are located every 3 to 4.5 miles apart on the course. 50K runners should bring a headlamp or flashlight. The 50K start will be before sunrise and the course is not lit. The Westside Y is located in an urban wilderness area and can be difficult to find if you are not familiar with the area. The main entrance is on the southeast corner of the I-44 / Hwy 75 interchange. It is located along the service road. Google maps provides accurate directions. Expect a zig-zag approach. There are several hotels within a few miles of the Westside Y. There is a good selection of hotels and restaurants at Hwy 75 and 71st Street in the Tulsa Hills shopping center. The Westside Y is an easy 10 minute drive from downtown Tulsa. It's difficult - but not impossible - to get off course at Turkey N Taturs. 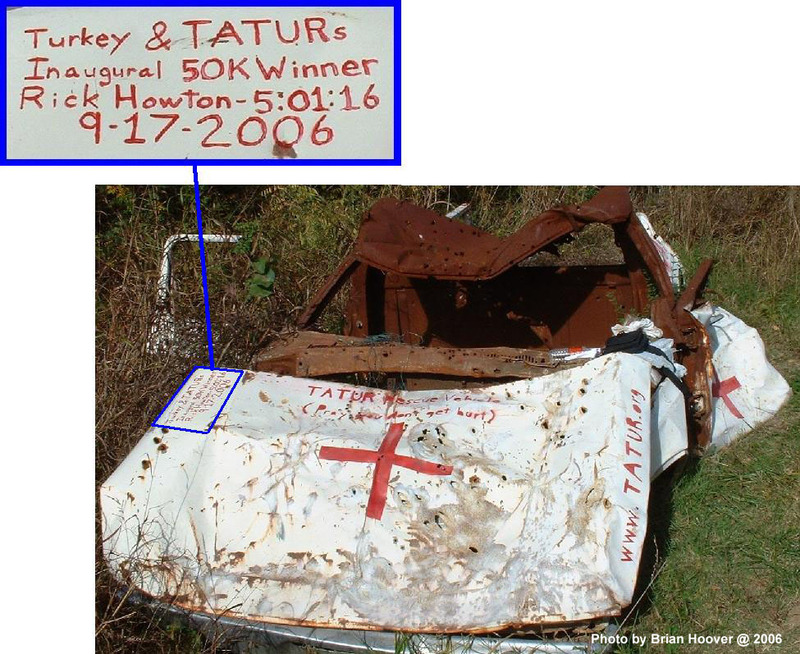 The Turkey 'N' Taturs Trail Race was conceived in the summer of 2006 by Race Director Brian Hoover and Mike Snyder. 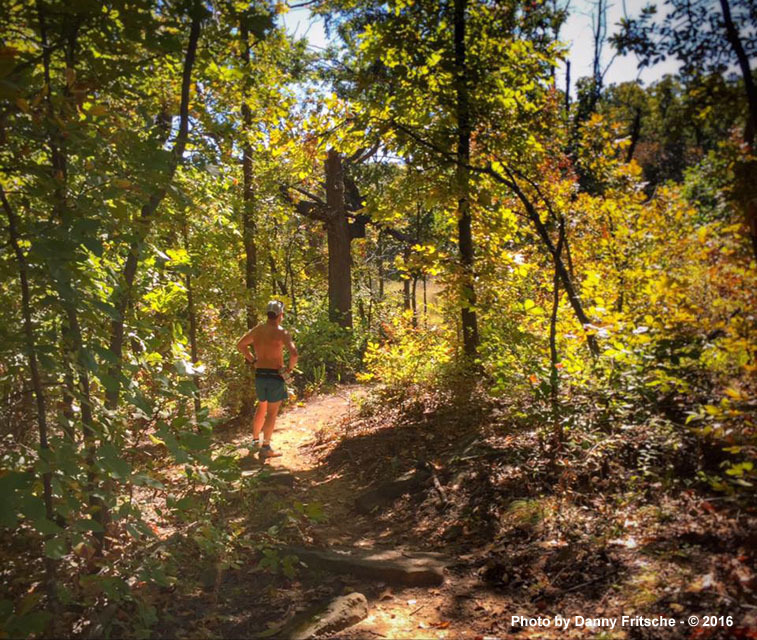 Trail running was starting to boom in the Tulsa area with the start of the Tulsa Area Trail & Ultra Runners club, the popularity of Turkey Mountain, and several short trail sprint races in the area. Tulsa needed a race that was longer than a marathon. Tulsa needed an ultra-marathon. Several people doubted that a 15.5 mile course could be laid out at Turkey Mountain without crossing itself or using the trail twice. They were wrong. Several people doubted that the 50K distance would attract more than a handful of crazies. They were wrong. Naysayers said that Turkey Mountain is too rocky, rooty, and that the area was just too difficult to run on for 30+ miles. They were WRONG !! 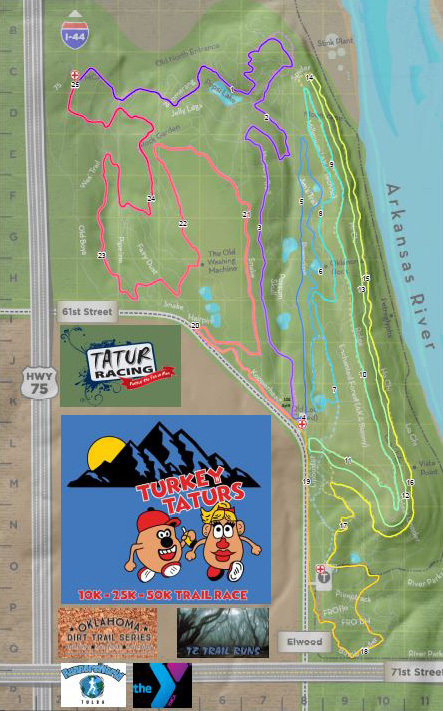 Due to the tremendous support of Tulsa's running community Turkey & Taturs has drawn runners from all over the country to enjoy the challenge and the beauty of Turkey Mountain. Many race directors try to duplicate the spirit and enthusiasm of Turkey 'N' Taturs but none can match Oklahoma's original ultra-distance trail race. 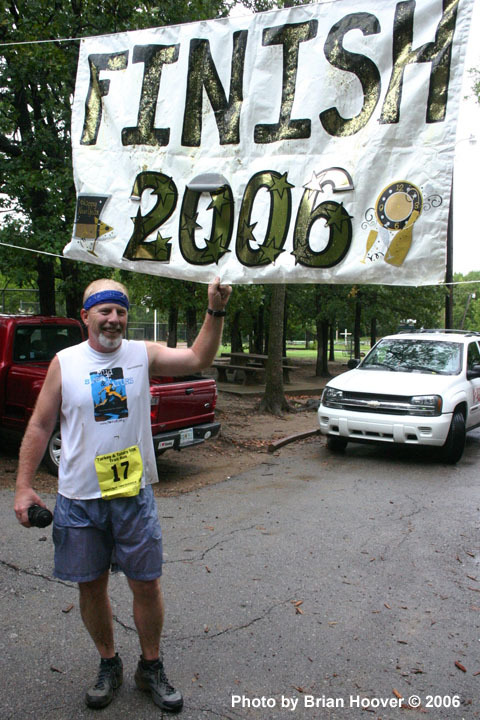 Many people have played a role in keeping Turkey 'N' Taturs the premier trail race in Oklahoma. Special thanks to everyone who had a hand throughout the years for making the Turkey & Taturs race such a success.